The Sun is a huge ball of incandescent plasma at the center of our Solar System. It accounts for more than 99% of the mass of the Solar System, and provides all the energy we need for life here on Earth. The Sun’s diameter is 1,392,000 kilometres or 865,000 miles; that’s 109 times the diameter of the Earth. You could fit 1.3 million planets the size of the Earth into the Sun. Everything in the Solar System orbits around the Sun, including 8 planets and their moons, many dwarf planets, asteroids, comets and dust. 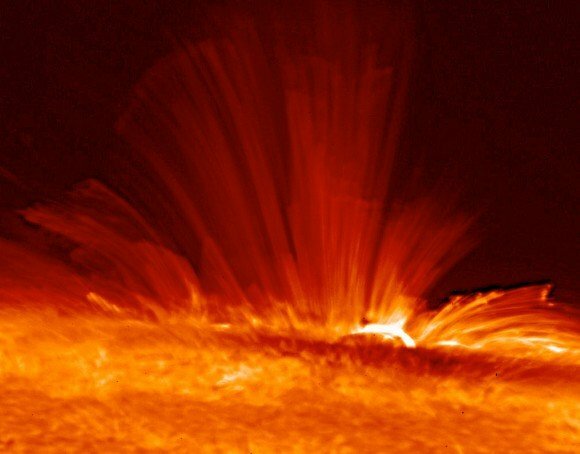 The surface of the Sun that we can see is called the photosphere, and it has an average temperature of about 5,800 kelvin. This is the point at which photons generated inside the Sun finally reach the vacuum of space. But if you could descend down into the Sun, you would find the temperature and pressure increasing until you reached the core of the Sun. At the core, the temperature is 15.7 million kelvin and the pressure is sufficient to support nuclear fusion. This is where protons are merged together to form atoms of helium, releasing tremendous amounts of energy. The Sun has been around for 4.6 billion years, and it’s expected to last for another 7 billion years or so. Once all the usable hydrogen in the core runs out, the Sun will expand outward into a red giant, consuming the inner planets (maybe even Earth). Then it will slough off its outer layers and collapse inward to become a white dwarf star.